Trying to cram in every idea that has occurred to me over the months I have been compiling my notes in blog form is not going to fly. The number of pages to execute would make the book so heavy it wouldn’t even be shippable by barge! I can see the original book I envisioned can easily be made into THREE books. I have such a wide range of ideas and topics that I want to express and convey. I am refocusing my effort to what I want to examine the most. 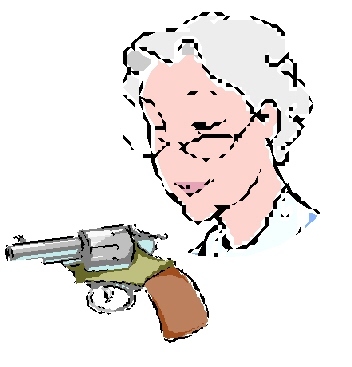 I’ve narrowed the premier tome to assisting a mature woman make the decision to buy, or not to buy, a gun for self defense. That leaves a lot of room for generalized discussion, facts, and considerations. This is the topic I believe is the least addressed in what I have found “out there,” particularly as it relates to the more mature woman. I’m thinking the second book in the series will discuss basic information about hand guns and ammunition, basic shooting practices, and of course, safety. Finally the third one would be how does a mature woman carry, store, use, and become prepared mentally, physically, emotionally for the situations and consequences she may encounter. I thought since this is my first structured attempt at finally “writing a book,” I might as well blog about the process. Much akin to deciding to make any serious change in life going “public” helps with accountability! While the content of “the book that will be” has changed multiple times throughout my life, the common denominator has been a failure to find a process to write. The “starts” with no “finishes” has resulted in a graveyard of paper, Word files, and best intentions. This time I am on a mission. And it helps that I finally can make some time to devote to the process, and have a wonderful husband who is supportive – if somewhat bemused. I have always been the “wind beneath the wings” kind of person, and I am very content doing that. But writing is something I have wanted to do for ME from early childhood. I feel I have quite a few books in me, and I’m not getting any younger. Lends me courage to get to it when I think about it in that respect. I’ve never formally studied “how to write” a book. I concentrated on “hard science” in school, worked in the electronics industry in the 70’s and 80’s and have written a lot of training manuals in my day along with countless database programs to accomplish tasks. All very practical. But not what is in my heart! To cope with my inner child who loves to play and distract me, I started another blog ( located at silverdustbunnies.wordpress.com ) so that I would have an outlet for the oddball topics that come pouring of my imagination as I sit at the keyboard. I am ready. I already have completed the first leg on this journey, and ready for the next. I copied these blog articles to my computer and discovered they total a startling 30,843 words once compiled! Anyway, I am now about the process of outlining how I want the book to flow, and when I catch a break from that… and my day job…. and working with my husband’s leather business… and the garden… and the other blog, and…. well you get the point… I’ll update where I am at on this journey.